Our wheat arrangements are on display in a national cafe-bakery chain of stores with over 1,000 locations. Additionally, you can see our wheat creations on display in the United States Capitol, State Capitol of Oregon, the Pendleton Center for the Arts, local retail stores, many businesses and numerous homes. Our wheat arrangements are used as head table/podium displays and table centerpieces at conventions and meetings. 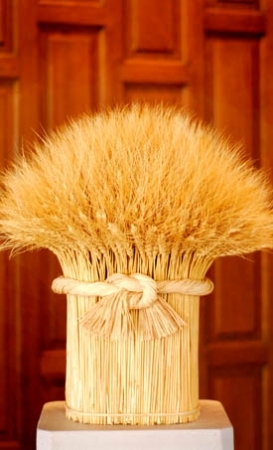 Instead of the use of floral arrangements for weddings, our wheat arrangements are a popular, long lasting display. As a corporate gift or a gift to someone special, our wheat arrangements are appreciated for their uniqueness. An arrangement of wheat at a funeral service as a symbolic remembrance for a loved one.